First of all, I think we can all agree that I deserve major points for posting after the first week of school, when I could be getting some extra sleep or enjoying some of the luxuries I haven’t indulged in much this week, like sitting or silence. 😉 In all seriousness, though, the week went really well, and I’m enjoying my transition into 5th grade. With 5th graders, I sometimes I have to repeat my directions. With 2nd graders, I ALWAYS had to repeat my directions multiple times. Sometimes I repeated myself so many times that I felt like words started to lose their meaning. The first week with 2nd graders, we practiced reading to ourselves and timed how long we could do it as a class. We were usually lucky if we could last 2 or 3 minutes before someone started talking or wandering around the room. When I had my 5th graders practice reading to themselves, they actually read! And it was silent…for about 15 minutes! (It was kind of unbelievable. I wanted to revel in it and just gaze in wonder at them, but then I remembered I had a million things to do). 2nd graders will often grab my hand in the hallway, tell me I’m pretty, and hug me unexpectedly in the middle of a sentence. 5th graders don’t do this as frequently, but I’ve still received a few hugs. I had to clean up after my 2nd graders. I have to clean up after my 5th graders. Some things don’t change. Oh well. I’m sure parents can relate. So, all in all, I’m enjoying the changes I’m experiencing in 5th grade and am looking forward to getting to go deeper with my students in our Language Arts and Social Studies lessons. 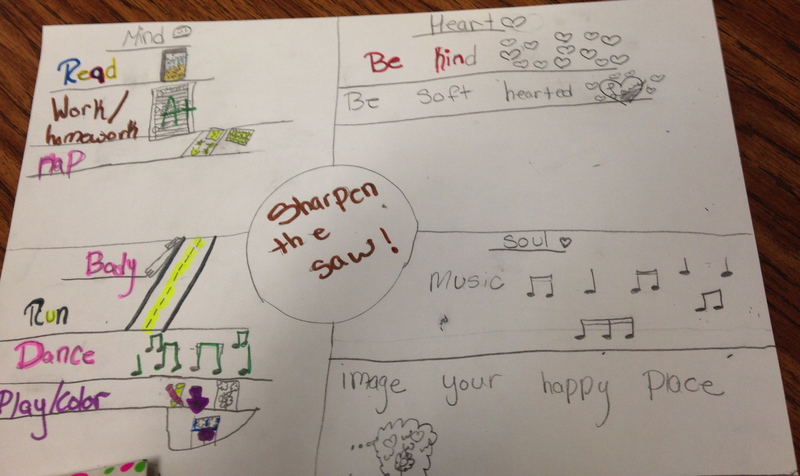 Students created posters showing how they “sharpen the saw” in the 4 main areas of mind, body, heart, & soul. 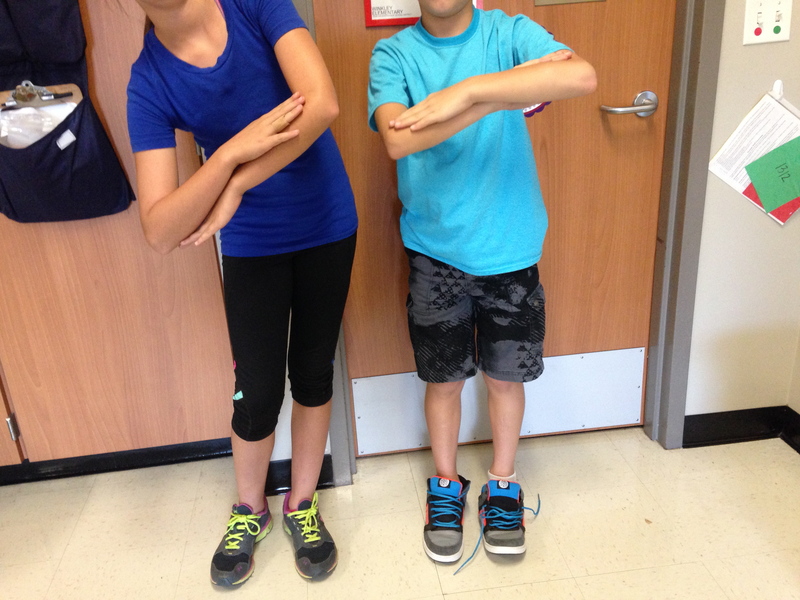 5th grade students were taught all of Stephen Covey’s 7 Habits by rotating through the 5th grade teacher’s classrooms. This also gave them a chance to get to know all the teachers and for me to try to learn 150 kids’ names in 2 days (please don’t quiz me). We built some time into each day for all the 5th graders to get together for some team-building games and learning about the value of synergizing (“Together we are better!”). The students really seemed to enjoy it and participated in various team challenges. Plus, it gave them a chance to socialize and interact with friends from other classes, which they REALLY enjoyed. 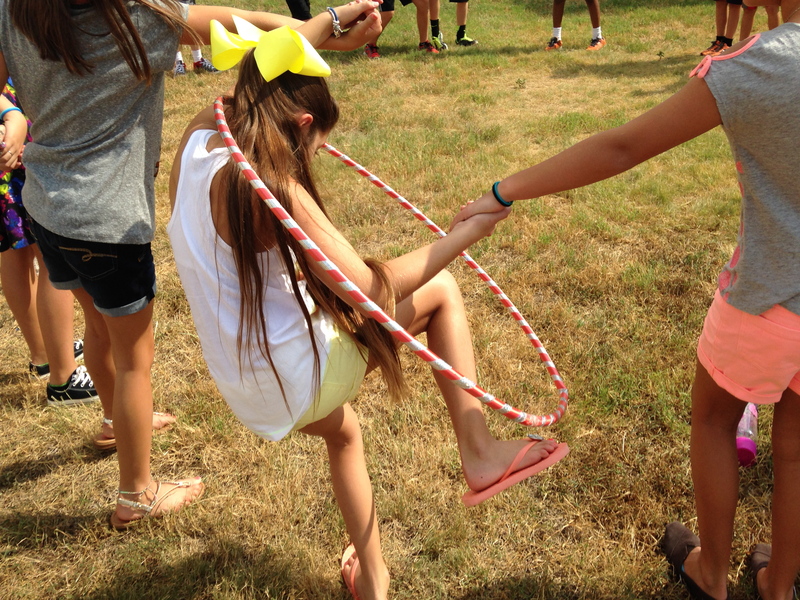 The students all connected in a circle, holding hands, and had to get the hula hoop all the way around the circle without disconnecting. Every year, I’ve created a social contract with my class, going over the way we will treat each other. This was the first year I used something called the “Win-Win Philosophy” to create it, and I thought it went really well. Basically, as a class, we went through common behaviors that can cause a disruption in the average classroom. We covered attention-seeking, anger, boredom, being energetic, being uninformed, avoiding failure, and control-seeking. We discussed how none of those behaviors are innately bad and that it’s okay to want or need to express those things sometimes; however, there are disruptive and responsible ways to express them. I was really impressed with the thoughtfulness and depth of the conversation that we were able to have, and in the end the students came up with a social contract statement. “Our class agrees that we will work hard to use the 7 Habits of Happy Kids, so that we will learn to be responsible and respectful people, knowing that it is okay to sometimes make mistakes.” It was totally their idea to use the 7 Habits language in their statement. I think they can already see how the 7 habits will help them in their daily lives. We learned motions for the 7 Habits. This is the one for synergize. Next week, we will be having a normal schedule and digging into the 5th grade curriculum. I’ve already started a read-aloud , which I will be using to model reading behaviors. And we’ll be setting up our Writer’s Folders to help keep our writing organized. I went to an Educational Technology meet-up last weekend, where we viewed student films from the White House Film Festival. It really inspired me to find creative ways to encourage students to 1) believe they each have a story to tell & 2) find creative ways to tell their stories. I hope that our Writer’s Workshop time will be a good stepping stone for that. If you have the time, I encourage you to check out the awesome short-films students entered into the festival. The participants ranged in age from elementary to high-school, and the films really showcase the amazing things that students are able to do with technology.